Like particle beams in a circular accelerator, two Japanese cultural obsessions—smell and technology—have collided to produce a sparkling array of new olfactory devices. 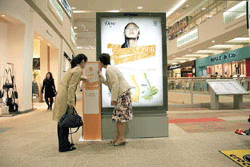 It’s difficult not to smell something, and it directly sends commands to your brain, so the promotional effect is big. Hmmm. Might want to soften the rhetoric a bit, Inoue-san; wouldn't a “polite olfactory suggestion” of curry have an equally big promotional effect? Japan Times writer Kazuaki Nagata also describes @aroma, a Tokyo firm that has been placing scent devices in hotels and stores to create brand-specific ambience. 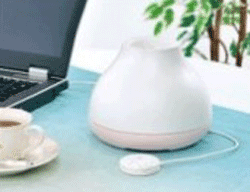 Then there’s NTT Com’s i-Aroma device which links to your PC with a USB cable. It contains six aromas that can be released individually or in combinations. NTT is promoting the device in consumer trials this summer featuring online content and smells designed by an aromatherapist(natch!) and an astrologer (whuh?). Sadly DigiScents failed to attract the investment it needed and went bust in 2001. Well, that’s partly correct—I know because I was there. Yes, the company went bust in 2001, but it had attracted tons of money. The problem wasn’t technology or lack of money. But that’s a story for another day.